Welcome to JP, your complete solution center for metal recycling. JP is one of the Midwest's newest scrap metal recyclers, committed to the eco-friendly collection and disposal of unwanted vehicles and scrap metal. We proudly serve Des Moines Metropolitan Area, Polk County and portions of Dallas and Warren counties. We offer our customers a full range of on-site services including containers ranging from 55 gallon drums to pallet boxes to roll-off containers up to 40 yards. 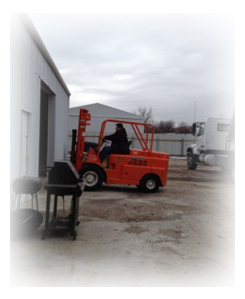 JP employees are fully insured and will take care of your scrap in a timely and professional manner. If you prefer to drop off, visit our collection center at 840 SE 21st, 1 block south of Maury. We will help you unload. JP also purchases all makes and models of junk cars, trucks and vans from a variety of sources everyday. Vehicles are stored and dismantled in accordance with all local, state, federal, EPA, and DNR regulations, removing and properly disposing of all fluids and refrigerants. Our goal is to responsibly recycle for a sustainable Earth while professionally serving our customers and community. Please call or visit us today!